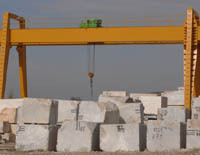 Standard sizes for blocks are 3,20–3,60 m x 1,60–2,00 m x 1,20–1,60 m. It is possible to purchase blocks directly from some quarries. However, it is more usual that blocks are purchased from a dedicated wholesalers. Every year the Bärlocher AG extracts about 10.000 m³ Rorschacher Sandstein from its own quarry. Lino Polti e Figli offers Calanca Gneis from own quarries.